“I don’t think I’m alone in voicing an appeal, from the fan’s viewpoint, for the shorter film. I know Photoplay has expressed similar opinions. Well do I remember the old days when a one reel Biograph was a classic. Do you recall ‘The Mender of Nets,’ ‘The Battle,’ and all the rest? What a wallop lay in their condensed force!” Letter to the editor, Photoplay Magazine, July 1917. 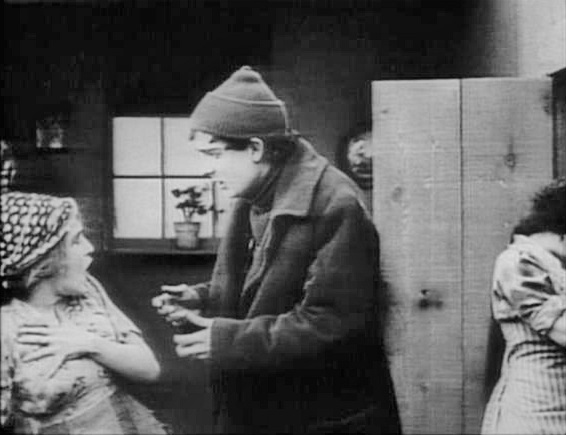 The Little Mender (Mary Pickford), hearing gunshots from inside the cabin, fears for the life of her fiancé. Within minutes, her hopes and plans for their future together will unravel. 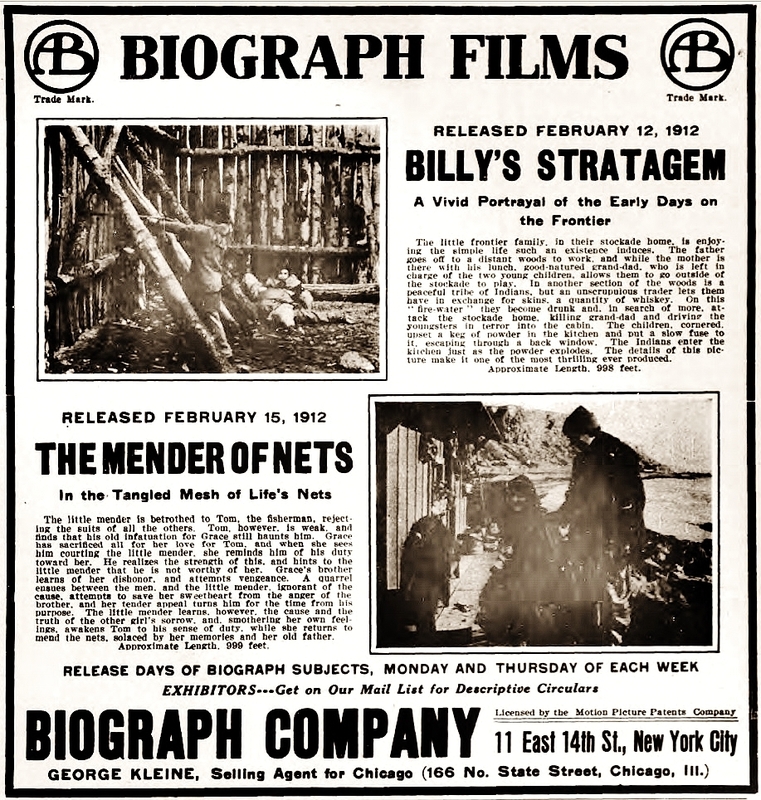 The Mender of Nets (Biograph, 1912, directed by D. W. Griffith). 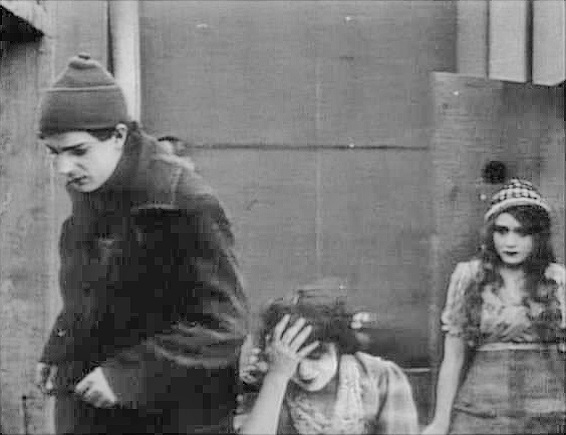 The demise of the single reel drama between 1912 and 1917 was as significant and sweeping as the death of silent film between 1928 and 1931. With the adoption of the feature film as its standard product, every aspect of the American film industry — the production, distribution and exhibition of motion pictures — was impacted dramatically. As with the coming of sound, there was a vocal minority whose arguments against the change fell on deaf ears. Generations growing up with sound saw the silents as quaint relics, much as audiences for silent feature films perceived the single reel pictures as an inferior product of a bygone era — one of storefront picture shows and nickelodeons. It is a bias that persists to this day. 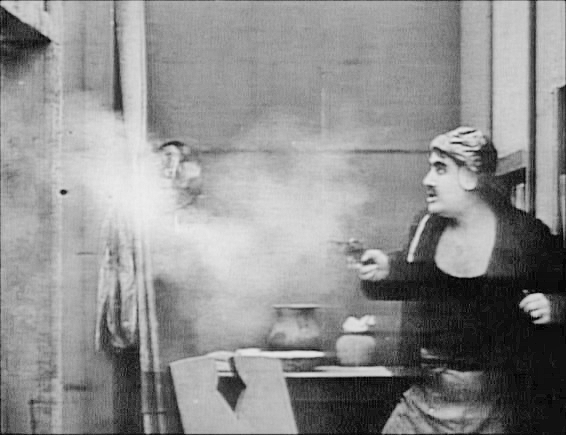 Among even those who consider themselves devotees of silent film, there remains a prejudice against films predating the feature. 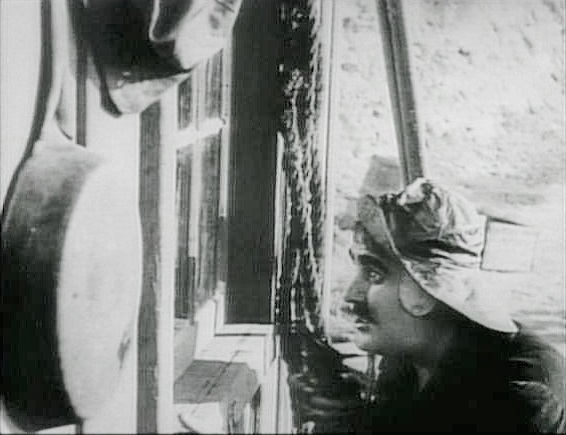 Sadly, few seem to recognize that this prejudice is no different than that exhibited toward silent film in general — or the bias against monochrome or film itself — by contemporary viewers. 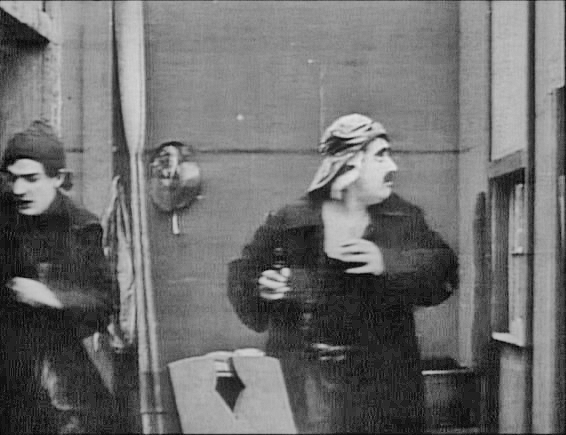 The primary complaint even among the fans of silent film is that early, single reel motion pictures are “primitive.” Such complaint in any other art form — literature, music, theater, painting, sculpture or architecture — would be dismissed as uninformed at best. When the Biograph Company made their third annual winter pilgrimage to Southern California in January of 1912, Mary Pickford joined them for the second and final time. 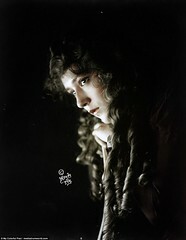 Having left Griffith and company behind to join the Independent Moving Picture Company at the end of 1910, “Little Mary” had spent a tumultuous year with the IMP, the Majestic and Owen Moore. 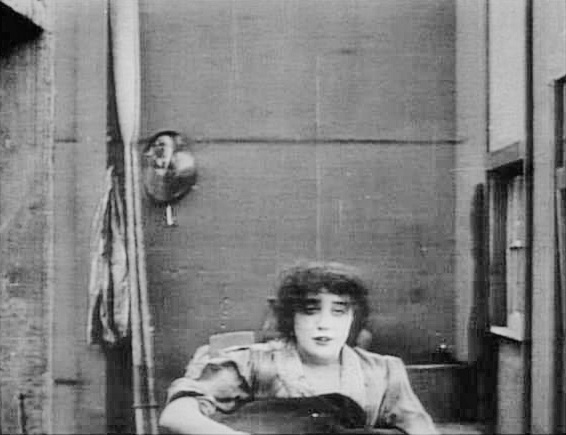 Those twelve months left her so physically, mentally and spiritually exhausted that she gladly returned to her first home in moving pictures — Biograph and Griffith — as they were about to leave New York and the East Fourteenth Street studio to journey west once again. For Mary Pickford, not yet twenty but a veteran of more than a hundred and twenty films, it would be something akin to a spiritual and artistic renewal. In the following twelve months she would do her best work to date, capping the first phase of her film career, a period in which she drew the blueprint for motion picture acting and laid the foundation for a new art form. Despite the fact that Mary Pickford had become during her hiatus from Biograph the best-known motion picture star in America, Biograph did not use her name in the publicity for their product. Privately, Biograph acknowledged the value of the Pickford property: she had been rehired at the same salary Carl Laemmle at the IMP had offered one year earlier to lure her away — $175 per week. 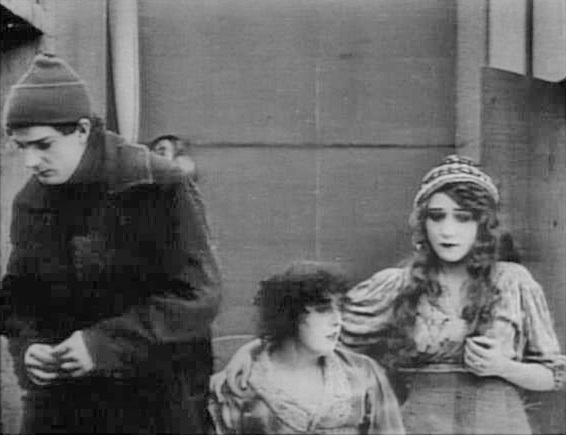 And despite the rise to prominence of new female leads at Biograph, such as Blanche Sweet, Dorothy Bernard and Mabel Normand, Griffith wasted no time in placing Pickford before the camera. 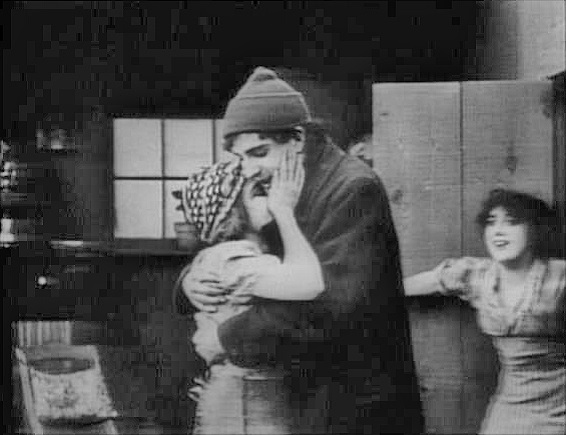 His first film upon arriving in California for the 1912 winter season would be a vehicle for his prodigal player, a film that was as much an announcement in celluloid that Pickford was back in the Biograph fold as it was a seaside drama involving a romantic triangle. 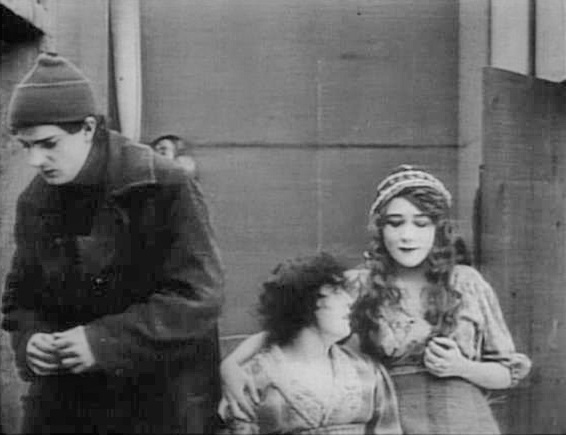 It was also clearly a showcase for Pickford’s phenomenal acting talent and camera presence. The Mender of Nets is a basic, elemental, even austere story — more a plot outline rather than a well-developed scenario — with no credited author. A simple seaside maiden, a fisherman’s only daughter, mends nets for the local fisher-folk. 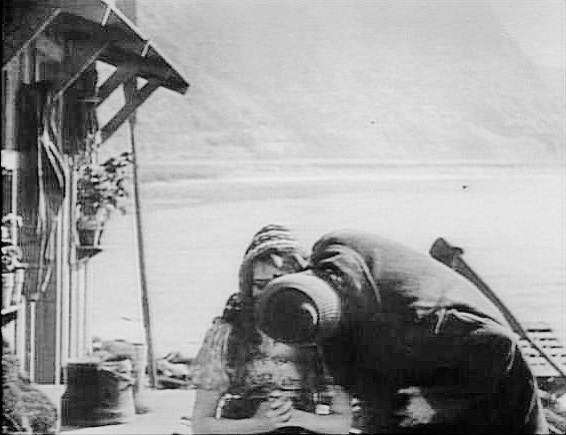 She is courted and engaged to a young fisherman who has recently loved another. 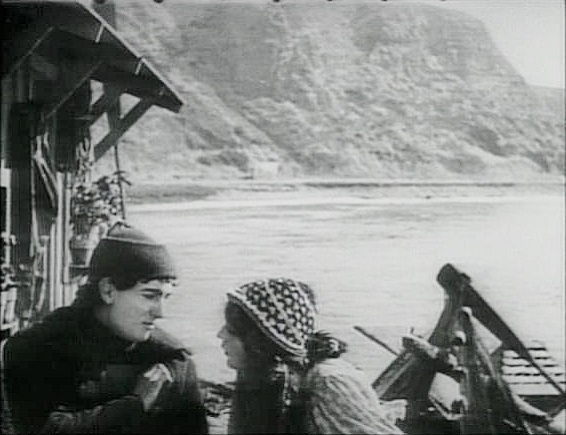 The other discovers the rival maiden and confronts her wayward lover, as does her angry brother who threatens and attempts to kill the young fisherman. The maiden, the “little mender of nets,” intercedes to prevent a tragedy, not knowing the reason for the attempted homicide. When she learns of her fisherman fiance’s relationship with and conduct toward the other girl, she releases him. But she desires to make things right and mends the broken relationship between the former lovers. 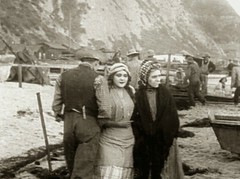 The construction of the film is straightforward, and the setting takes advantage of the outdoor location, a Pacific cove near Santa Monica where Griffith shot one of his first California films in 1910, The Unchanging Sea. All but three of twelve camera set-ups are outdoors. 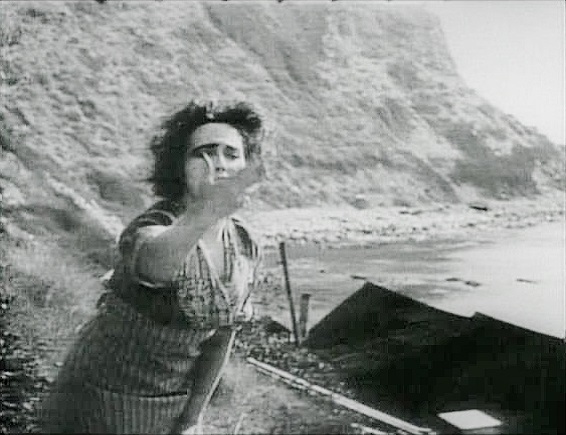 Although the cinematography serves the story more than the scenery, Billy Bitzer’s camera uses the ocean backdrop frequently to frame the action, particularly during the opening and closing shots that bookend the film. Griffith employs these shots to create this circular device that is the film’s most notable editing construct. 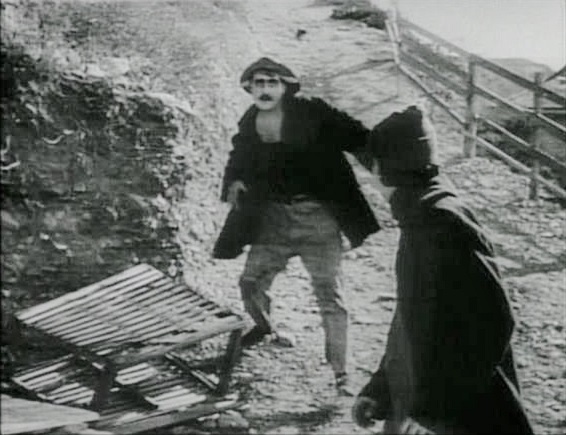 By 1912, Griffith’s familiar crosscutting technique, used here to build tension seamlessly in service of a simple plot, had become a trademark of the Griffith/Biograph product and is almost imperceptible to the general audience, as it should be. 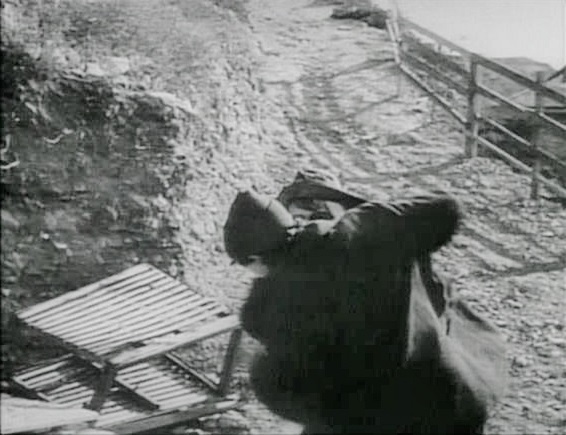 The use of the more obvious bookend device, a technique to bring a story full circle from opening to closing shots, used previously to great effect in Corner in Wheat and The Country Doctor (both from 1909), usually accompanies a tale that is ultimately melancholy in tone. The Mender of Nets is no exception. 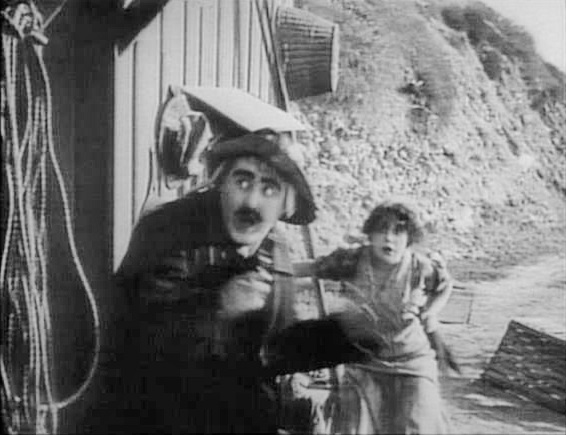 Shot at Santa Monica and at the rented studio in Los Angeles in early January 1912, The Mender of Nets was released February 15, 1912 at 999 feet. 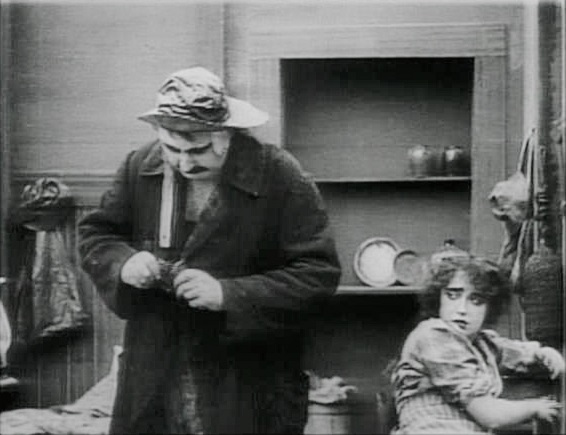 It runs between twelve and fourteen minutes, depending upon projection speed (and I would argue in favor of a slower projection speed to better appreciate the nuances of the Pickford performance). 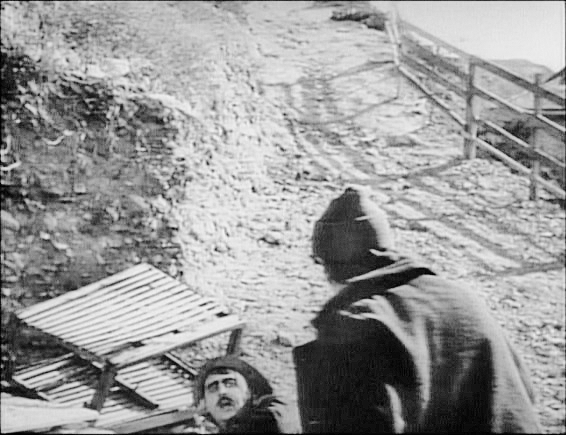 Additionally, the film has only eight intertitles, just half of which can be considered “dialogue” titles. As is typical in Griffith Biographs, however, the titles — even those with “dialogue” — precede the action rather than explaining it after-the-fact. 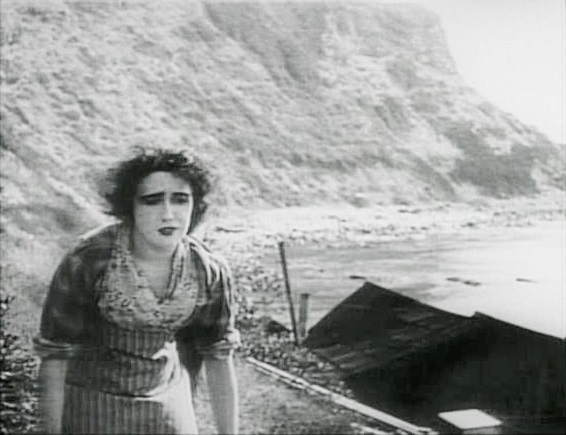 The film opens with a fade-in — a lyrical shot of Mary Pickford, “The Little Mender,” seeming to emerge from “the mists” of a Pacific cove at Santa Monica. 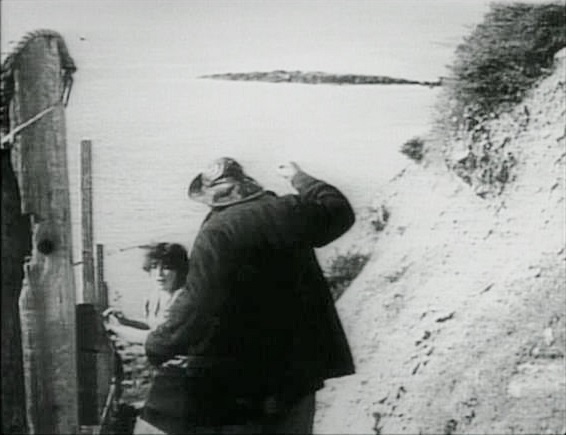 Bitzer’s camera lingers for more than half a minute on the image of Pickford, a medium-close shot framed by the cove, the crashing of breakers on the far shore and surrounding hills. 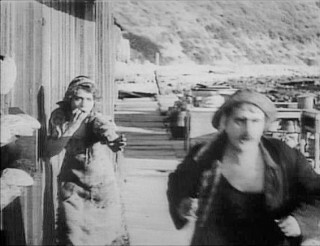 Contemporary observers, such as the reviewer from The Moving Picture World, thought the fade-in was actually “atmospheric” effects, literally mists enveloping the Santa Monica bay and Pickford, rather than Bitzer’s moody re-introduction of Biograph’s star player after a year’s absence. 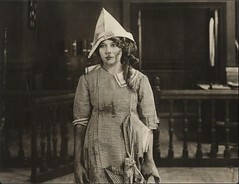 The camera lingers on Pickford in a medium shot far longer than necessary to establish her character, the unnamed “Little Mender” — it is both an advertisement of and an ode to the Pickford face. 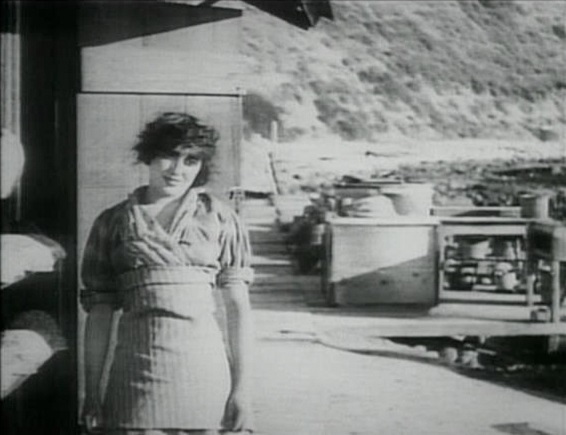 Nearly one minute into the initial shot of the film, we learn that she is the mender of fishermen’s nets, living with her elderly father (W. Chrystie Miller) among the fisher-folk along the coast. 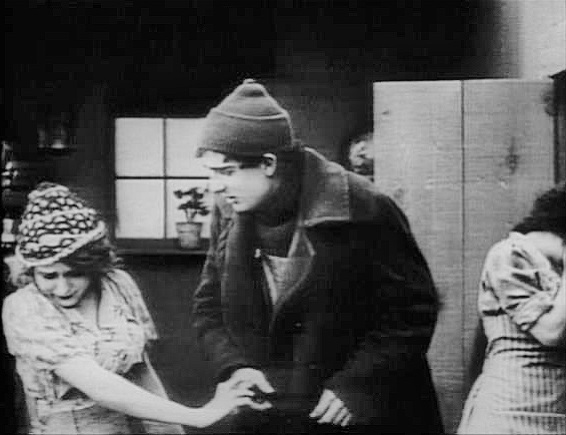 [First Intertitle: “THE BETROTHAL.”] As the shot changes from medium to medium-close, a young fisherman, Tom (Charles H. West), is courting the Little Mender and asks for her hand . . .
She accepts his proposal of marriage and he slips the ring onto her finger. The Little Mender is ecstatic . . .
Below . 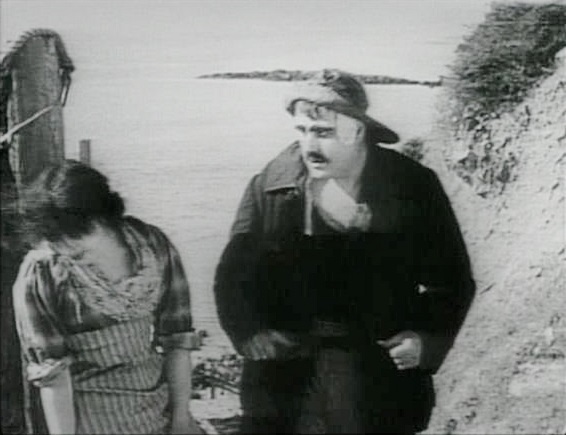 . . further up the hill lives Grace (Mabel Normand), the erstwhile lover of fisherman Tom. 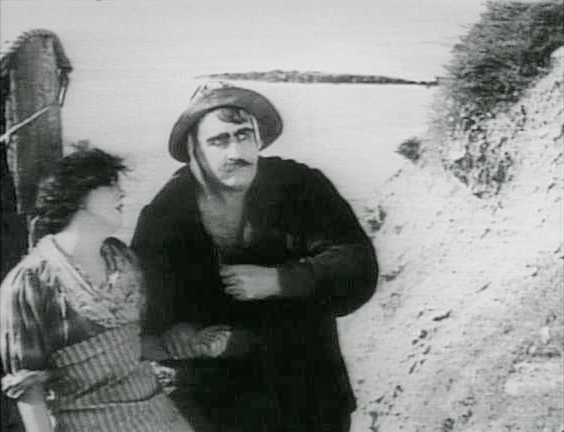 [Intertitle: “HIS WEAKNESS.”] Tom cannot help but return to Grace after seeing his betrothed. Grace feels the change in Tom without understanding the reason. Grace fears she is losing Tom, the only man she has ever loved. While the Mender celebrates her engagement with her father, admiring her ring, . . .
. . . Tom has left Grace alone and miserable in the cabin she shares with her brother. But Tom’s behavior only arouses suspicion in Grace — and those suspicions are soon confirmed when she sees him with the Mender, who reassures Tom that he IS “good enough” . . .
As Grace sees them cuddling, her worst fears are realized . . .
. . . she is losing him to another. Panicked, she gestures frantically to get his attention . . .
. . . and fortunately for Tom, the Mender is blissfully unaware of the commotion. 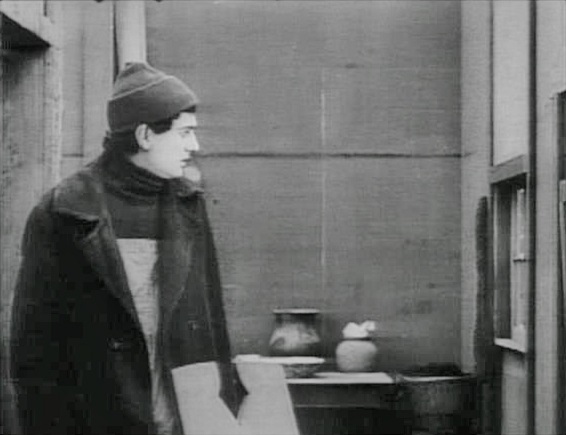 [Intertitle: “YOU CAN’T MARRY ANOTHER — WHAT OF ME?”] Tom admits to Grace that he loves and is now betrothed to the Mender. Judging by her body language, the relationship between Grace and Tom had been a serious one, with some expectation of commitment. This is confirmed by the synopsis in the Biograph Bulletin press release which states that Grace “has sacrificed all for her love of Tom,” apparently meaning that she has lost her virginity to him. A further, alternative explanation is that Grace could also be pregnant. But this may be an application of modern sensibilities on late 19th-early 20th century values, with pregnancy being for the modern viewer a stronger motivation for Grace’s reaction than the “sacrifice” of her virginity. Tom rejects his former lover. Grace is devastated. Her brother (Dell Henderson), having overheard the exchange, is livid. Her brother confirms with Grace what he has just heard — that his sister has been with a man who now dishonors her by leaving her for another. The brother cannot conceal his disgust with his sister. 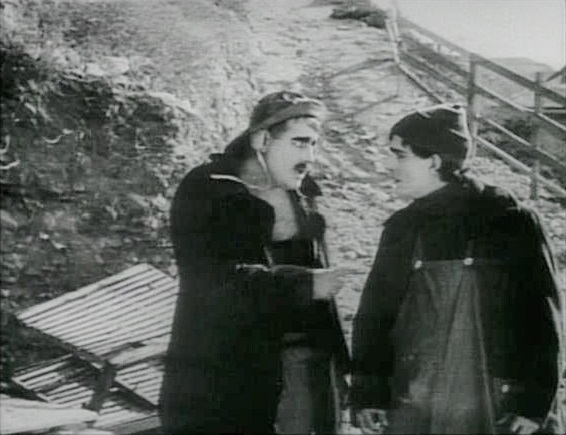 He berates her for her relationship with the fisherman, and immediately confronts him. 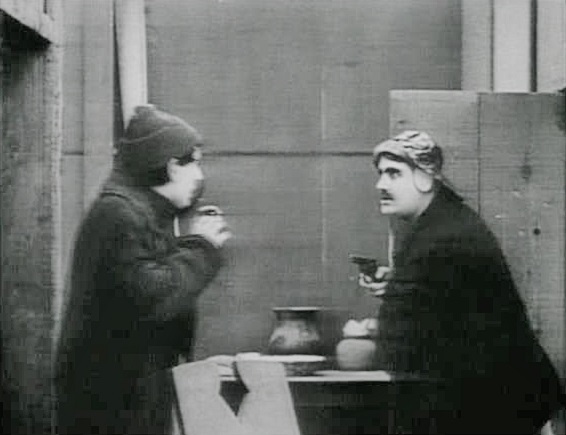 The Mender notices the argument from her cabin below, and borrows her father’s binoculars to see who is fighting. To her horror, she sees her fiancé struggling with another man . . . The two men scuffle, and then break apart with the fisherman having slightly wounded the brother (a cut on the temple). 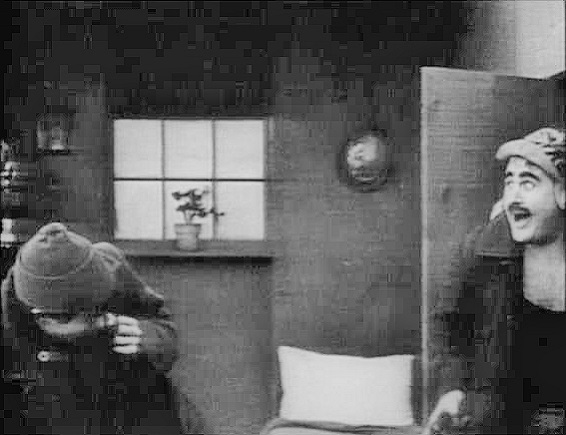 The brother declares the matter is not over, and returns to the cabin where he finds sister Grace moping. Grace watches him loading a pistol. Realizing what he is about to do, she begs him to stop, to no avail. In the meantime, the Mender has made her way up the hill to the cabin of Grace and her brother, just in time to see him leaving — with the gun. She nearly faints with anxiety, but recovers to pursue the brother, not knowing anything except that he wants to kill her fiancé. 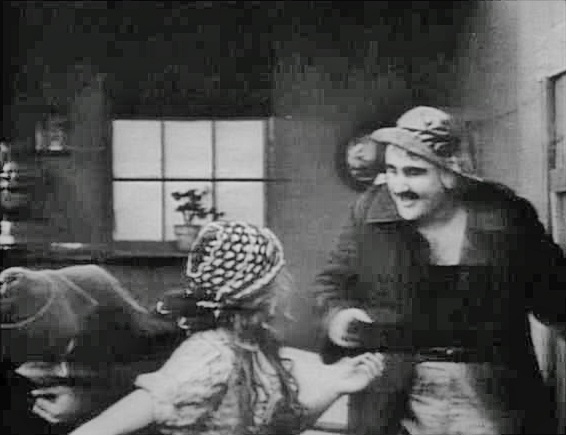 The brother reaches Tom’s cabin, knocks on the door, and when the fisherman answers, he bursts inside. 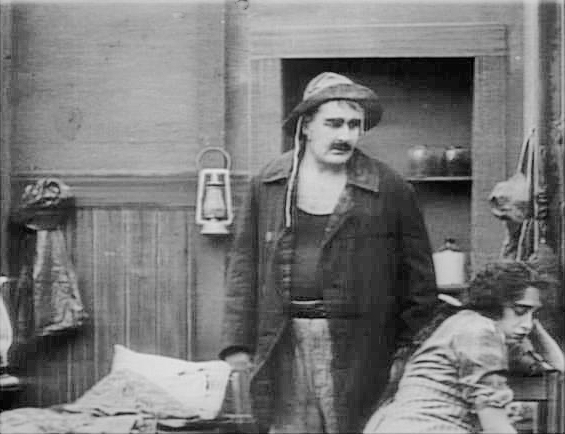 The Mender has reached the scene just after he has entered the cabin . . . The brother hears someone outside and is momentarily distracted, allowing Tom to escape to an interior room. The brother fires the first of two shots at the closed door. The Mender hears the shots and fears the worst. In her cabin below, Grace likewise hears gunfire . . . The Mender bursts into the cabin, somehow rushes past the brother, and places her body between her love and his assailant. 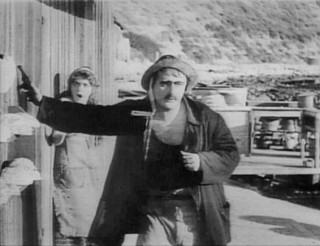 The brother points to himself as being the one injured in the prior scuffle, then leaves, apparently satisfied in his quest for revenge by having terrified the cowering fisherman. 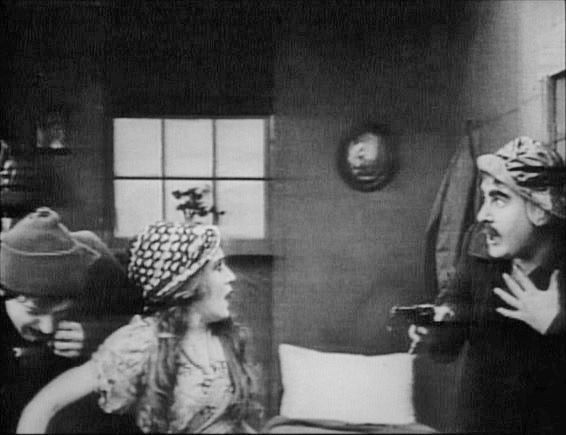 Grace has reached the cabin in time to see her brother leaving, gun in hand, and suspects Tom may be wounded or dead . . . To her great relief, Tom is alive . . .
. . . but with the Mender. Not knowing who Grace is or what she wants of her Tom, the Mender clings to him. 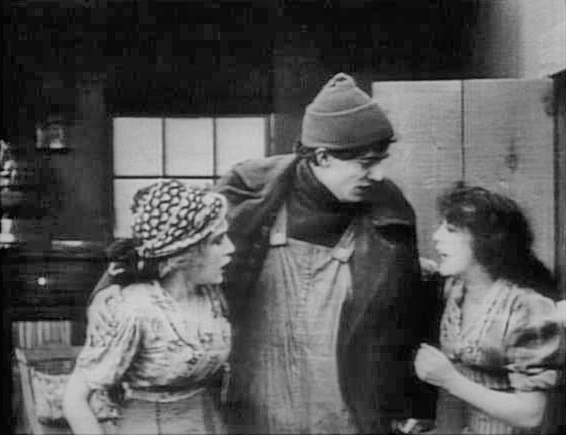 Grace begins to explain her connection to the Mender’s fiancé. 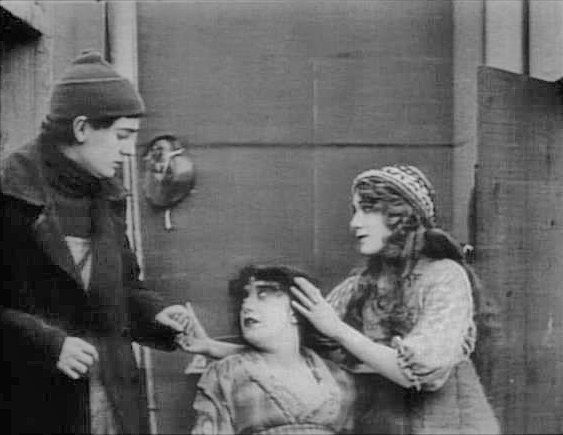 At first furious at the girl, the Mender is overwhelmed by the reality that Tom has deceived her. Tom then tells her the whole story . . .
. . . that he and Grace were lovers. The Mender breaks from his touch in disgust. She can no longer be with him. From outside the cabin she hears Grace weeping, and realizes that she has unwittingly been the cause of the rift between the fisherman and Grace. Though she cannot be with Tom, she can make amends. The Mender comforts Grace . . .
. . . then begins to repair the broken relationship. She asks Tom to look at what he has given up and to reconsider. She gently coaxes him to reunite with Grace in a gesture: she takes his hand in hers and places it around the shoulder of Grace, as if to stitch together the broken net of their love. The Mender leaves the cabin, feeling the heavy weight of her own loss. Tom and Grace, his head in her lap, are reunited. 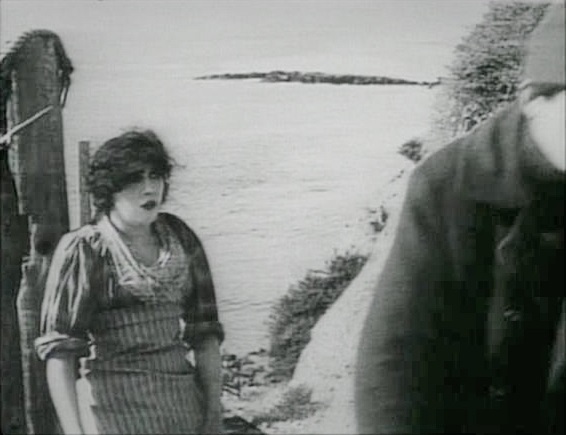 The Mender returns to her father and the cabin by the cove. With a smile for her father, she returns to her nets . . .
“I’LL MEND THE NETS” [final intertitle]. Alternating smiles and tears, the Mender accepts the sorrow — she has found peace. And with the fade out, the story comes full circle: the Mender continues her work by the sea. It is well worth noting, as many observers and historians have, that the primary reviewer of motion pictures for the Dramatic Mirror in their “Spectator’s Column,” was Frank E. Woods, pioneer film critic, and a founding member of the Academy of Motion Picture Arts and Sciences. Woods was also a paid contributor to and future member of the Biograph scenario department who would in 1914 write the first draft of the screen adaptation of Thomas Dixon’s The Clansman for the film that would become D. W. Griffith’s Birth of a Nation. “The happy symbolism of the title as applied to the sisterly act of the pretty little mender of nets is in itself so full of meaning that it adds character to the story . 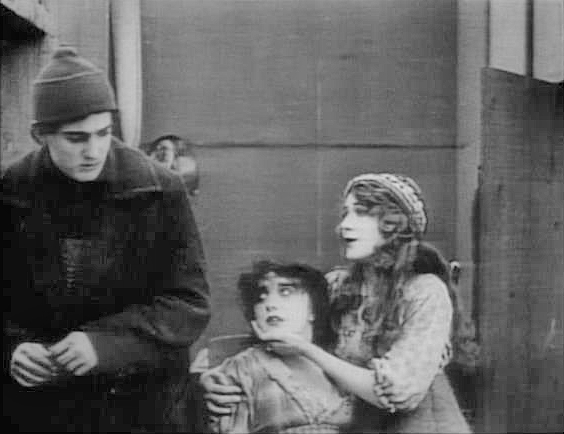 . . intensely thrilling without being theatric and melodramatic. . . . [the story] could have been presented without a single sub-caption so clear and well constructed were the scenes.” The New York Dramatic Mirror, February 21, 1912. “The Biograph Company can hardly object to our mention of Little Mary’s name; she is the mender of nets. 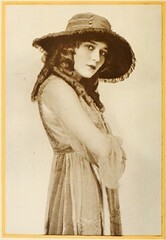 The other girl in the picture everybody knows as “Betty.” The Moving Picture World, March 2, 1912. 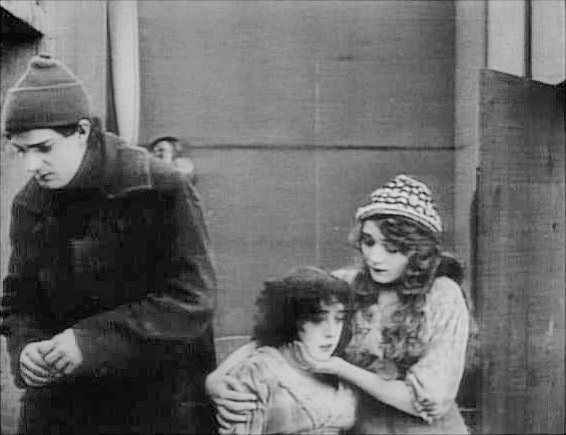 Despite the lack of name recognition from her employer, Mary Pickford received what could be considered the ultimate compliment for her performance as The Little Mender from a rather unlikely source. 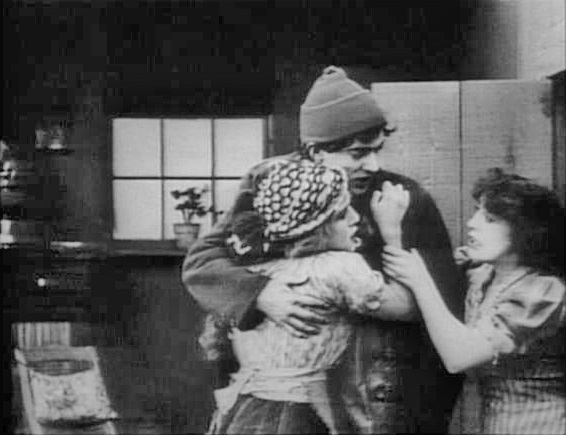 “‘THE MENDER OF NETS’ was produced solely because some Biograph employee prepared it; because Mary Pickford could carry out the story in a new way. [emphasis added]. The Photo Playwright, April 1912. 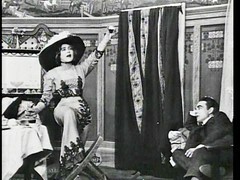 Without Mary Pickford, a simple sketch of “an old theme” such as The Mender of Nets would not likely have been undertaken by Griffith as the first production of his latest venture in California. 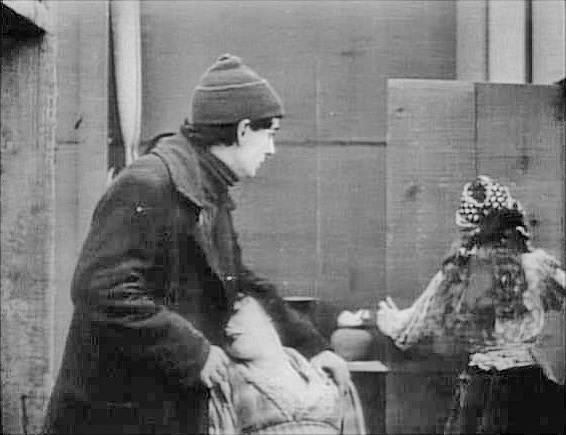 We would not have the opportunity to watch a groundbreaking artist demonstrate the power of motion picture acting in an approach so subtle, elemental and affecting as is Pickford’s performance. And we would not have the unique result of the marriage of profound talent and simplicity of purpose that is contained within the single reel of The Mender of Nets. 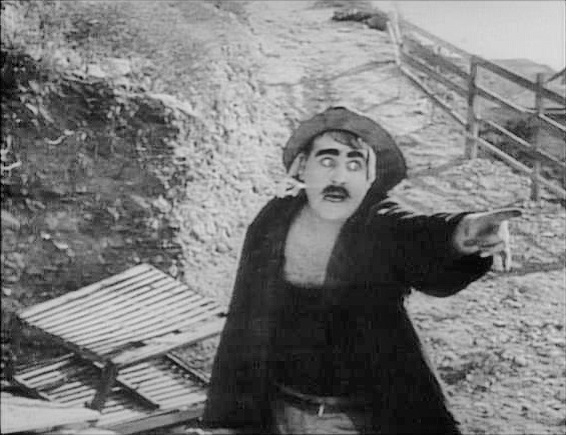 Usai, Paolo Cherchi, General Editor, The Griffith Project, Volume 6, Films Produced in 1912. (BFI Publishing, 2002. ); pp. 1-3, “The Mender of Nets,” essay by Yuri Tsivian. Usai, Paolo Cherchi, General Editor, The Griffith Project, Volume 11, Selected Writings by D. W. Griffith; Indexes and Corrections to Volumes 1-10. 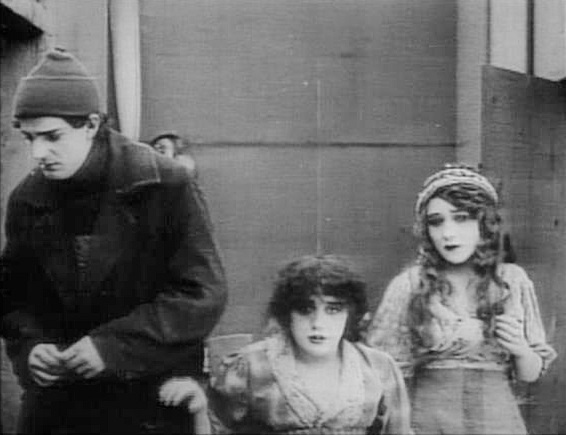 (BFI Publishing, 2007); p. 191, “393 The Mender of Nets,” corrections to the identity of the actors, Mabel Normand, Dell Henderson and W. Chrystie Miller. Schickel, Richard. “D. 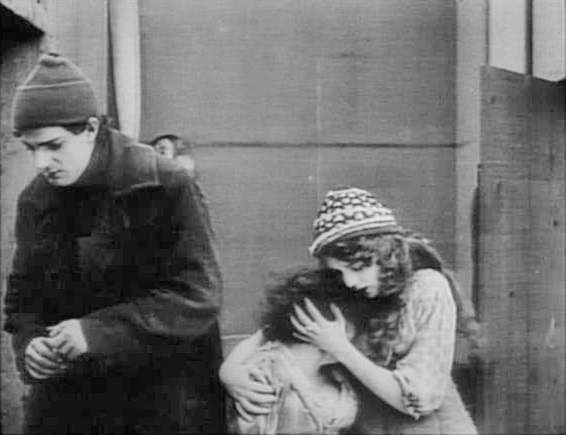 W. Griffith, An American Life.” (Limelight Editions, 1996). Henderson, Robert M., “D. 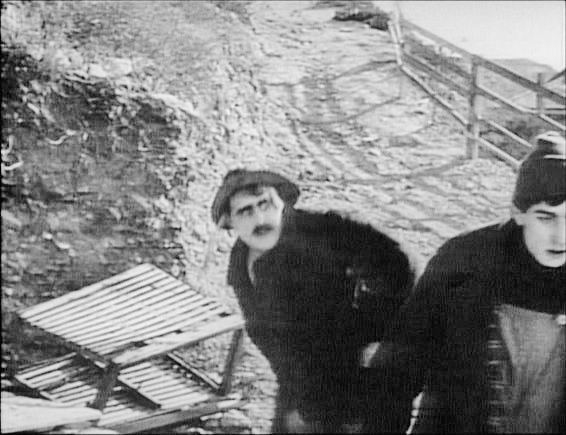 W. Griffith, The Years at Biograph.” (Farrar, Strauss and Giroux. 1970). Whitfield, Eileen, “Pickford: The Woman Who Made Hollywood,” (The University Press of Kentucky, 2007). The Media History Digital Library at mediahistoryproject.org for The Moving Picture World, Photoplay Magazine and The Photo Playwright.